New York, Chicago, London – February 13, 2018 – Vela, a leading provider of trading and market access technology, announced that it has won the category for Best Direct Market Access (DMA) Offering in the 2018 Fund Technology and WSL Awards. The awards were presented during a ceremony at the Yale Club in New York last week. The Fund Technology and WSL Awards 2018 (formerly the Wall Street Letter Institutional Trading Awards) recognize and reward providers who have demonstrated exceptional customer service and innovative product development over the past 12 months. Vela’s market access platform provides clients with a high performance, low latency, fully-normalized infrastructure for accessing global liquidity. Clients have a choice of fully-hosted, managed, or on-premise deployment models to gain access to award-winning components. 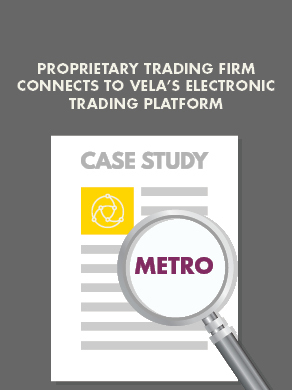 Connected to more than 40 global listed derivative exchanges with pre-trade risk capabilities, Vela’s market access platform helps sell-side and buy-side firms as well as financial services technology providers lower costs and risks by simplifying exchange connectivity.